Hope everyone had a wonderful Christmas! I did! My favorite part was after the presents are all wrapped and all the cooking was finished, I'd curl up in my chair with a ball of yarn and watch Hallmark Christmas movies. I have a few projects by request I could have been working on but I do not have the yarn colors handy and no way was I going fight the traffic to get some. They will have to wait a few days. That left me itching to make something. I didn't know what to make so I just grabbed a ball of yarn I had on hand and began fidgeting with it. I have seen where crafters will crochet with fingers and knit with arms but they all say you have to use bulky yarn. My yarn was not bulky, but I attempted it anyway. 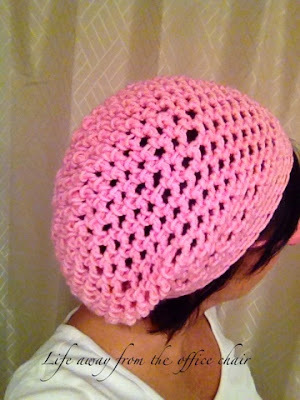 With just my fingers and and idea, I created a this cute summer beanie. "I bet bulky yarn doesn't say summer like my plain ol four ply worsted yarn" . Mine turned out soft and loose and worked up just fine. 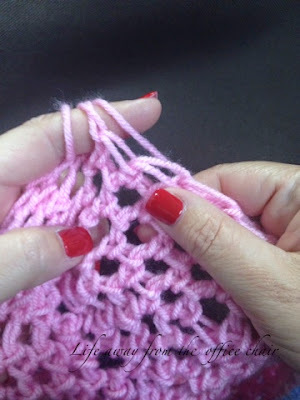 This is crocheted in the round, not joining at beginning stitch so grab a stitch marker. Repeat Row 4 approx 24 more times (depending how slouchy you want it). Tie off and weave ends. It was a little tricky during the first couple rounds but got alot easier as I went. Now that I have the feel for it. I may create a couple more. I have a pair of pink glasses that match this color and I looked like a total geek, but that's ok. It was just to get picture, which is hard to do by myself. Ha. I'm going to say it again, "Perfect for summer" with its light weight and airy feel. And speaking of summer, I can hardly wait!!!! 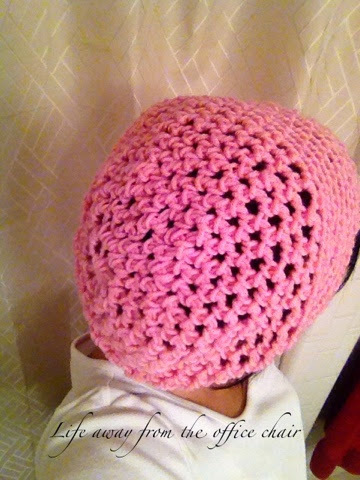 Wow I'm amazed that you made the hat with your fingers. I love the way it came out. I never made anything that way. Either I use knitting needles or crochet hook. Have a Happy New Year. ohhh how fun! I love that anyone can finger knit - no special tools needed :) and to make a beanie!! too awesome! Its kinda hard at first but gets easier as you go. Its awkward with your fingers but just pretend they are a crochet hook. Crochet in the round. You may need a stitch marker to mark the beginning of each row.